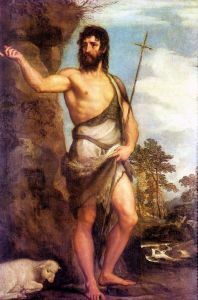 St. John The Baptist is more intimately bound up with the devotional scheme of the Legion than any of its other patrons, with the exception of St. Joseph. He was the type of all legionaries, that is, a forerunner of the Lord, going before him to prepare his way and make straight his paths. He was a model of unshakable strength and devotion to his cause for which he was ready to die, and for which he did die. Moreover, he was formed for his work by Our Blessed Lady herself, as all legionaries are supposed to be. St. Ambrose declares that the main purpose of Our Lady’s considerable stay with Elizabeth was the forming and appointing of the little Great-Prophet. The moment of that formation is celebrated by the Catena, our central prayer, which is laid as a daily duty on every legionary. That episode of the Visitation exhibits Our Lady in her capacity as Mediatrix for the first time, and St. John as the first beneficiary. Thereby was St. John exhibited from the first as a special patron of legionaries and of all legionary contacts, of the work of visitation in all its forms, and indeed of all legionary actions — these being but efforts to co-operate in Mary’s mediatorial office. He was one of the essential elements in the mission of our Lord. All those elements should find a place in any system which seeks to reproduce that mission. St. John the Baptist has two liturgical celebrations. That of his nativity occurs on 24 June, and of his martyrdom on 29 August.